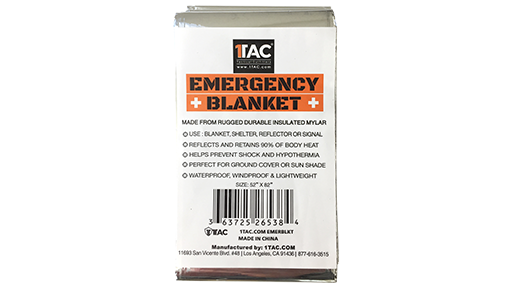 The 1Tac Emergency Blanket is a must have for any car, home or survival kit. Made from rugged, all-weather, durable mylar. The 1Tac Emergency Blanket is extremely multi-purpose. It can be used to retain body heat, shield the sun and inclement weather, used as ground cover, shelter or a to single for help and even functions as a rain catch. Be sure to always be prepared in any situation with multiple 1Tac Emergency Blankets.